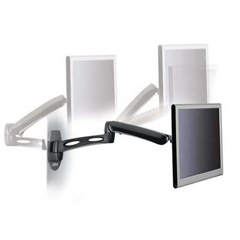 Ergonomic Wall Mount Monitor Arm easily adjusts up and down through 13" range. Monitor can rotate to portrait and landscape. Swivels 180 degrees and tilts forward and back 80 degrees for optimal ergonomic positioning. Includes wall mount hardware. Monitor arm fits both 75 mm x 75 mm and 100 mm x 100 mm VESA-D monitor bolt hole patterns. Designed for LCD monitors up to 20 lb.